Mirror photo by Gary M. Baranec Hunter Barr of the Golden Tigers tackles Central QB Braden Kitt in the second quarter on Friday in Roaring Spring. ROARING SPRING — Hollidaysburg quarterback Brady Walters needed 108 yards from scrimmage Friday night against Central to become the school’s all-time leader in that category. Not only did he do that, but he also contributed to all six touchdowns in the Golden Tigers’ 42-0 regular-season ending win over the Scarlet Dragons. Walters rushed 11 times for 90 yards and completed 5-of-8 passes for 75 yards and two touchdowns. He rushed for four touchdowns. What impressed Hollidaysburg coach Homer DeLattre even more was that Walters had no interceptions and no fumbles. In fact, no one fumbled on offense on a night in which the rain grew harder as the game went on. Hollidaysburg (6-4) scored on its first drive of the night, a 10-play, 87-yard drive that featured eight runs by Nate Fisher. The final play, however, was a 24-yard touchdown pass from Walters to Ben Drass. The two-point run failed, making it 6-0. Central followed with its best drive of the night as junior quarterback Braden Kitt took his team from its 33 down to the Tigers’ 3-yard line. However, four stops by the Tiger defense was a key moment in the first quarter. “That is a couple of weeks in a row that our defense did that. We did that against Tyrone, DuBois … Our defense has played better and better each week, and that is a tribute to our coaches and our kids for buying in,” DeLattre said. Baker also believed it was a turning point, but still thought the Golden Tigers were just too much for his young Dragons who were dealing with a lot of injuries toward the end of the season. Walters scored on two runs of 3 and 6 yards in the second quarter and hit tight end Gus Dellinger, who rumbled 41 yards for another score, to put Hollidaysburg up, 28-0, at halftime. “Our No. 1 must-do was control the line of scrimmage on both sides, and I think we did that. No. 2 was make sure the turnover ratio (4-to-0) was in our favor, and it was,” DeLattre said. Hollidaysburg scored two more times in the third quarter for 42-0 lead, thanks to runs of 12 and 14 yards by Walters. The mercy rule kicked in at the 8:03 mark of the third quarter. Despite the score, and like the 2018 season, Baker still saw effort from his Dragons. The Golden Tigers will now prep for a playoff game against District 8’s Brashear at Saint Francis this upcoming Friday night. 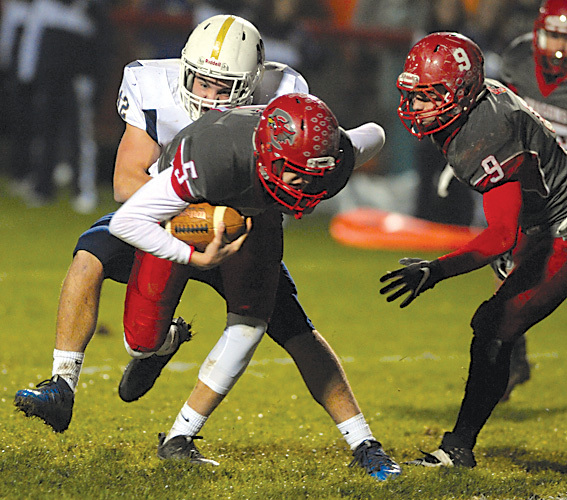 They can feel good about a ground attack that amassed 252 yards on 44 carries, with Fisher getting 67 on 12 carries and Hunter Barr netting 42 on 8 carries, and neither them or Walters played in the fourth quarter Friday night. RUSHING–Hollidaysburg, Walters 11-90, Fisher 12-67, Barr 8-42, Moss 1-4, Weyandt 3-20, Martellacci 4-19, Paddocjk 2-7, Robertson 2-4, TEAM 1-(-1). Central, Harbaugh 2-0, Marko 1-3, Quarello 2-25, Kitt 5-(-4), Kurtz 5-17, Hoover 6-25, Parks 1-(-2), Jefferies 2-9, Leidy 1-(-2), Holsinger 2-(-2), Wagner 2-4. PASSING–Hollidaysburg, Walters 5-8-0-75. Central, Kitt 7-19-2-46. RECEIVING–Hollidaysburg, Sensenig 2-15, Dellinger 1-41, Drass 1-24, Fisher 1-(-5). Central, Albright 1-4, McConahy 1-20, Walters 1-9, Parks 3-11, Kurtz 1-2.